Crisp and simplistic square white planters give this set of vibrant faux succulents a clean and light look, perfect for decorating work spaces, commercial settings, or the contemporary home. These vibrantly colored faux plants can be displayed together on the natural bamboo tray, or individually to add a bright accent to small spaces. At under 4 inches tall and 3 inches wide each, these plants are ideal for desk or counter decor, and can even be used to decorate bookshelves or windowsills. Since they require no watering or maintenance, they can provide years of enjoyment while staying fresh and green. SPECS: Overall - 3.9 H X 8.5 W X 2.8 D; Each Pot - 1.9 H X 2.6 W X 2.6 D (in inches). 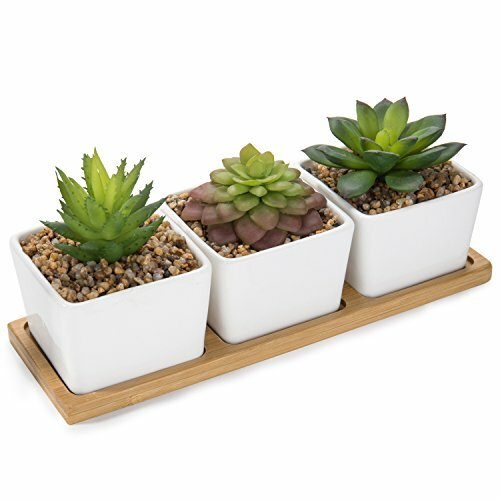 MINI SUCCULENT ASSORTMENT: Set of 3 small faux potted desert plants in square planters with bamboo tray. CLEAN MODERN ACCENT: Natural bamboo and white ceramic create a clean contemporary look, ideal for home or commercial decors. DESKTOP DECOR: 3 x 8-inch footprint allows for unobtrusive placement on desks, counters, and bookshelves. LOW-MAINTENANCE: Artificial plants require no watering or maintenance (except occasional dusting) to stay vibrant all year-long.